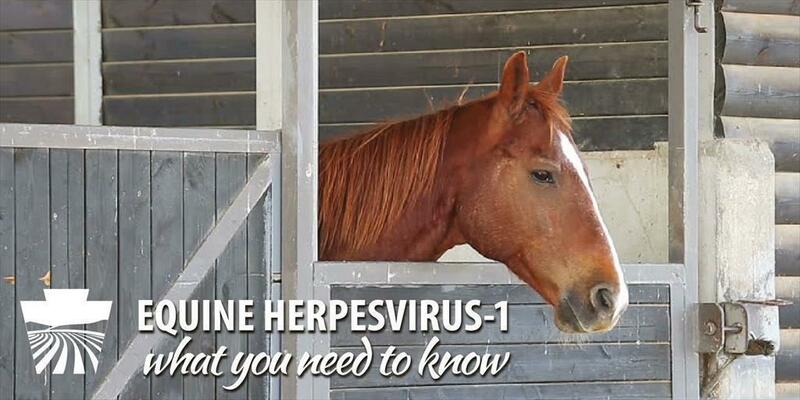 ​At any given time throughout the country, there are a few cases of equine herpesvirus-1 (EHV-1). EHV-1 is very contagious and is spread via horse-to-horse contact through nasal secretions. The disease can also be transmitted indirectly through contact with objects that are contaminated with the virus. The disease can live outside the horse’s body for seven to 30 days in the right environmental conditions. Biosecurity and knowing the signs of EHV-1 are crucial to minimizing its spread. EHV-1 can cause four manifestations of disease in horses: neurologic, respiratory, abortion and neonatal death. If a horse is exhibiting these signs or has been exposed to a horse with EHV-1, contact your veterinarian immediately. Horses that are at risk due to possible exposure to EHV-1, should take precautionary steps to minimize the spread. Those potentially affected should be isolated; housed away from other horses (stabled in a barn, turn out shed, paddock or another area where there is no contact with other horses); use different dedicated equipment to feed, clean and work with them than is used with other horses; and follow rigorous hygiene procedures for horse handlers. Owners should call their veterinarians to discuss how long to keep the horses isolated and check the horse’s temperature daily. Even if fever does not develop, typical advice may suggest that the horse stay isolated for at least 21 days. For more information, visit the American Association of Equine Practitioner’s FAQ page​ on EHV.